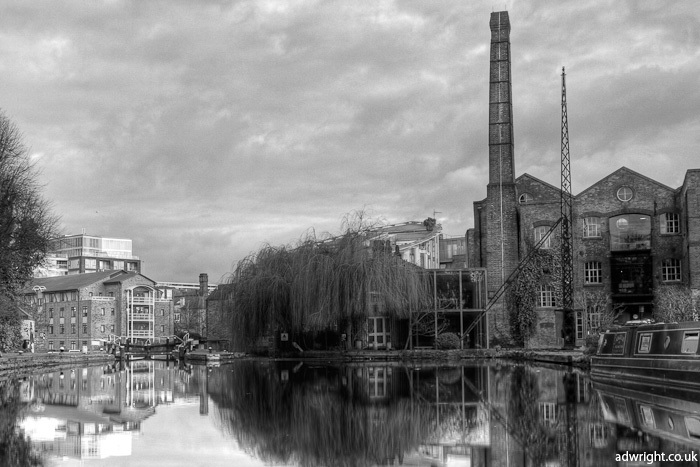 I went for a wander along Regent’s Canal a couple of weeks ago. 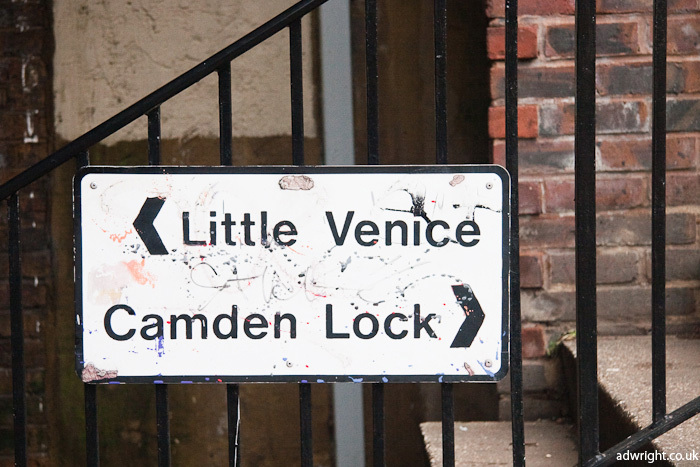 I’ve only seen a few small parts of it before, mainly from Regent’s Park to Camden Town, but I’d read that it makes for a pleasant walk. 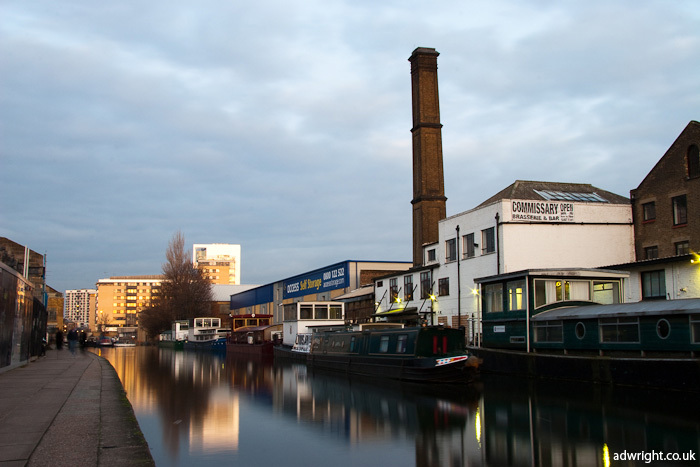 Unfortunately, as it is still winter, the skies were rather more grey than I had hoped, and I ran out of light before I could complete the journey along the length of the canal, which may not have been a bad thing as it all gets a bit industrial through Hackney. I may revisit the route at a later date, perhaps starting at the other end. 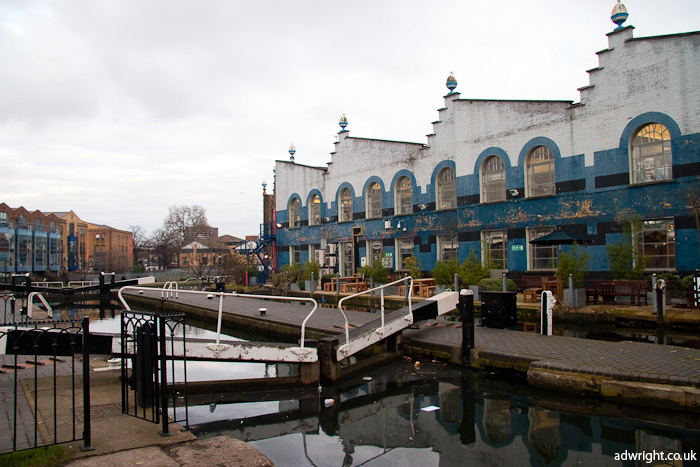 There’s also the possibility of a quick diversion to Old Ford Lock of Big Breakfast fame; however, I’d have to check up in advance with regards to access as I think it skirts the Olympic Park compulsory purchase zone. 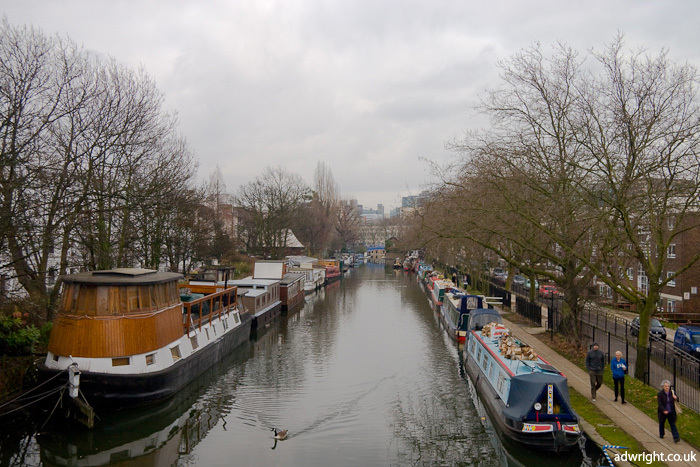 Regent’s Canal is an eight and a half mile long waterway running east-west across north London, parallel to the Thames. 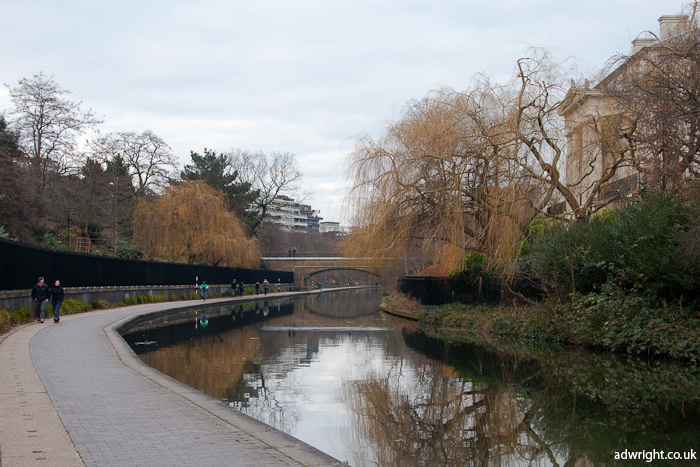 The canal was designed by the architect, John Nash, who designed Regent’s Park, but most of its construction was overseen by his assistant James Morgan. 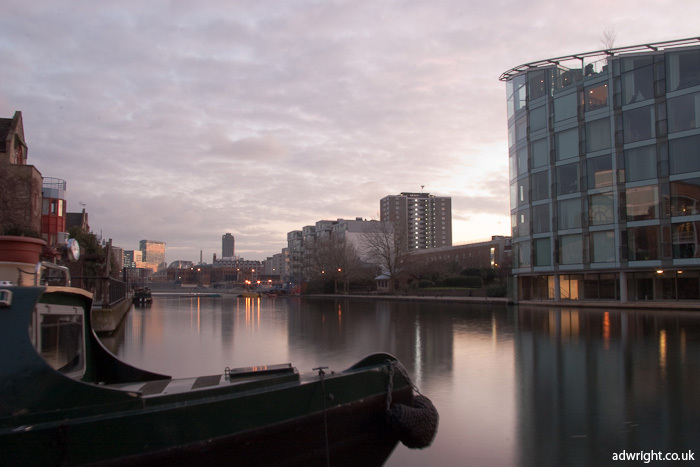 Construction commenced after the passing of the Regent’s Canal Act in 1812 and the official opening took place in 1820, for the first time connecting the Grand Junction Canal (now part of the Grand Union Canal) in the west to the docks of east London. The canal saw great success until the railways began to divert trade away from waterways in the latter half of the 19th century. After the munitions traffic of World War II ended, the canal was hardly used for commercial traffic. 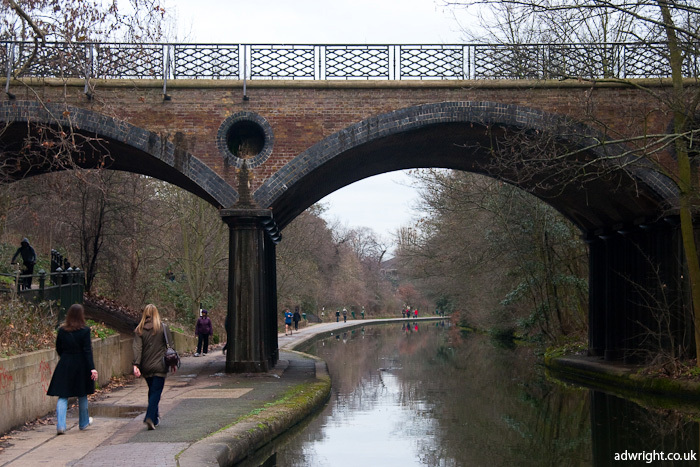 I started my walk from Warwick Avenue tube station, which is approximately 5 minutes away from the Grand Union Canal. 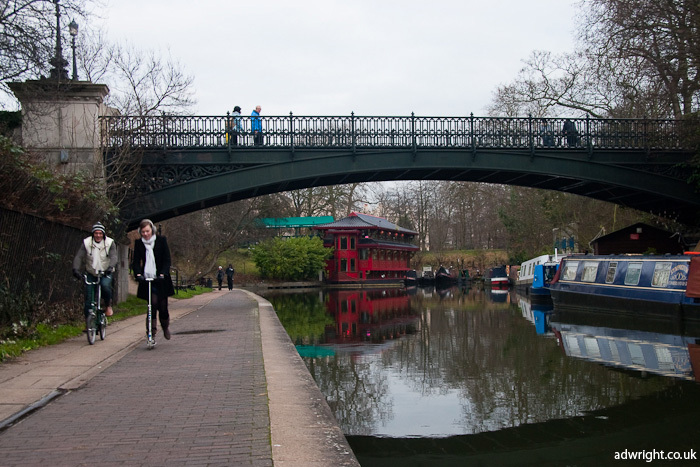 After a brief chat with another photographer out taking pictures of the area, I walked the 500 metres or so south to reach the area known as Little Venice, where the Grand Union Canal meets the start of Regent’s Canal. This is a relatively unknown area of London, believed to have been named by the author Robert Browning, who lived here from 1862 to 1887. 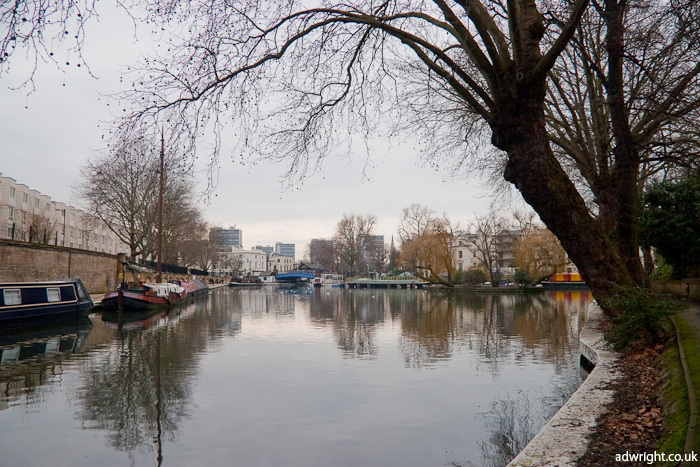 ‘Browning’s Pool’ – the junction between the Grand Union Canal and Regent’s Canal is named after him. 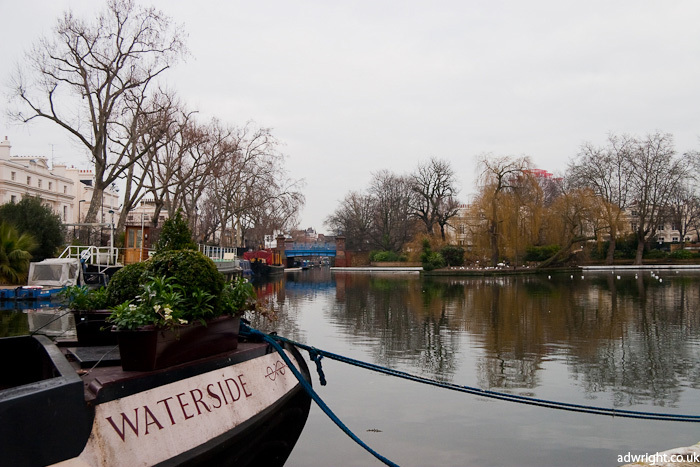 On sunnier days, boat trips leave from here towards Camden, through Regent’s Park and past London Zoo – the route that I chose to walk. ‘Standing Man’ by Sean Henry. 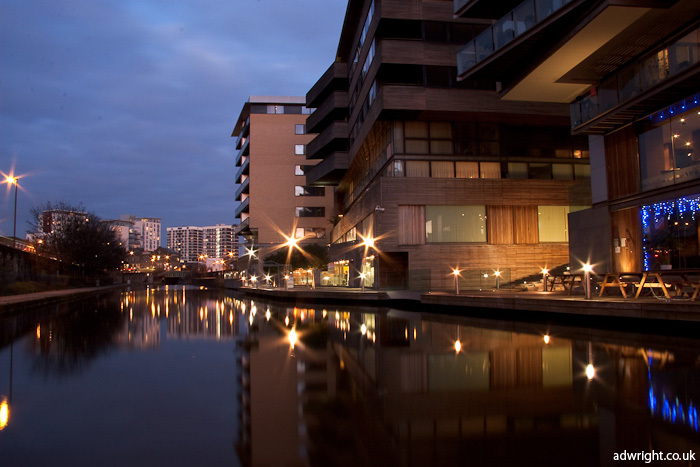 South of Browning’s Pool, the Grand Union Canal heads towards the Paddington Basin. I wandered down this way to cross over the canal. 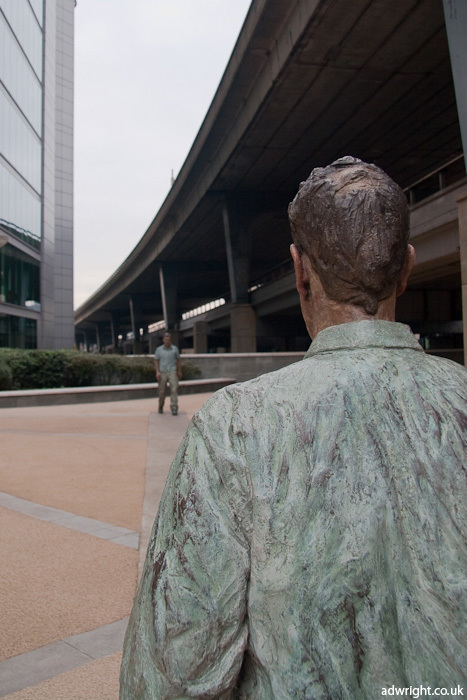 Under the A40, I found these two statues, starting at each other. They reminded me of some of the Gormley statues which are dotted around London and the rest of the UK. I crossed the footbridge over the Grand Union Canal, and headed back up the east bank, back toward’s Browning’s Pool. From Browning’s Pool eastwards, the footpath is private, accessible only to those using the moorings here. 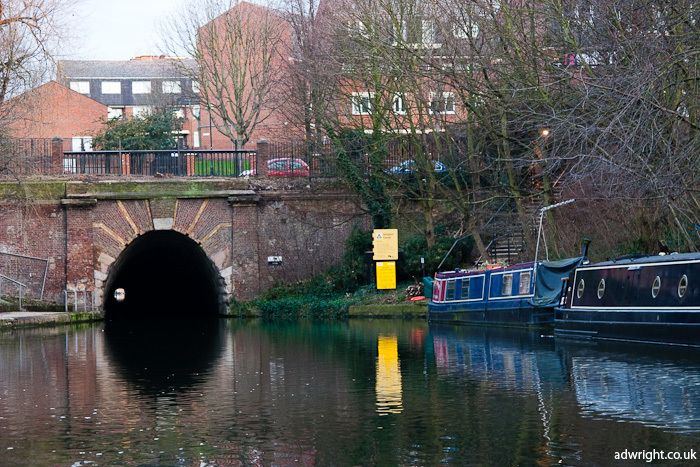 However, you can wander along the road either side of the canal, up towards the Maida Hill tunnel – the second longest on the canal. A cafe sits above the west portal. Crossing the Edgware Road, I walked briefly along Aberdeen Place, following the path of the canal underneath. Just before re-joining the towpath, I passed this closed-down pub, Crocker’s Folly. 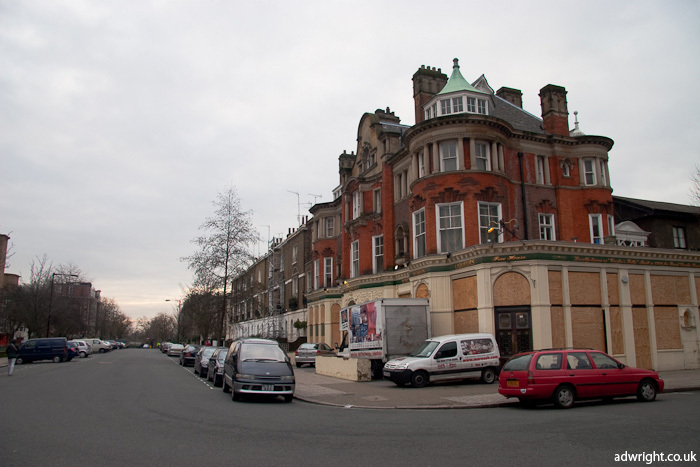 Allegedly, it was originally built in anticipation of a new railway terminus being built nearby, but when the terminus was instead built in Marylebone, the owner Frank Crocker hanged himself. Take with a pinch of salt, I think. Re-joining the canal via some stairs just east of Aberdeen Place, I found myself by the east portal of the tunnel. A plaque on the wall provided some further detail over the tunnel, outlining that Morgan had never had any previous experience in building tunnels! The ugly metal structure jutting out over the entrance of the tunnel carries some electrical conduit from the substation out of shot above-right. A second, much shorter tunnel follows quickly. This one, known as Eyre’s Tunnel, is only 53 metres long, and is, to all intents and purposes, no more than a bridge. 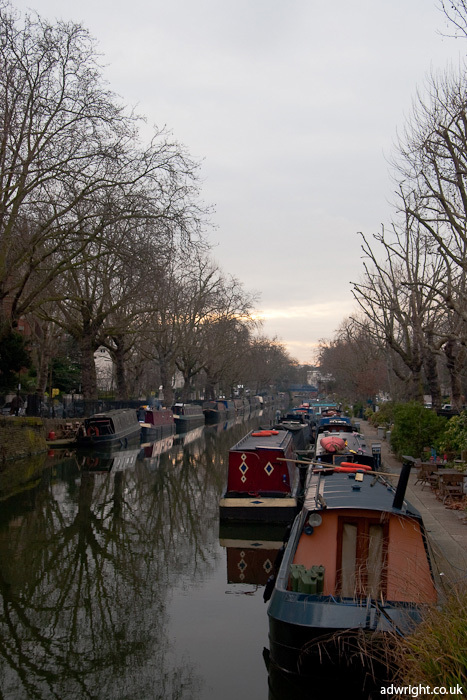 On the other side are the Lisson Grove moorings. The next kilometre or so from Lisson Grove was a bit bleak, walking under some very damp and dark railway bridges. For walkers joining the towpath just east of Regent’s Park, a sign indicated some of the key areas along the route. During my walk, I found the signage along the towpath to be excellent, giving points of interest and distances. I hope that similar signage exists along some of London’s other walking routes, which I intend to explore. 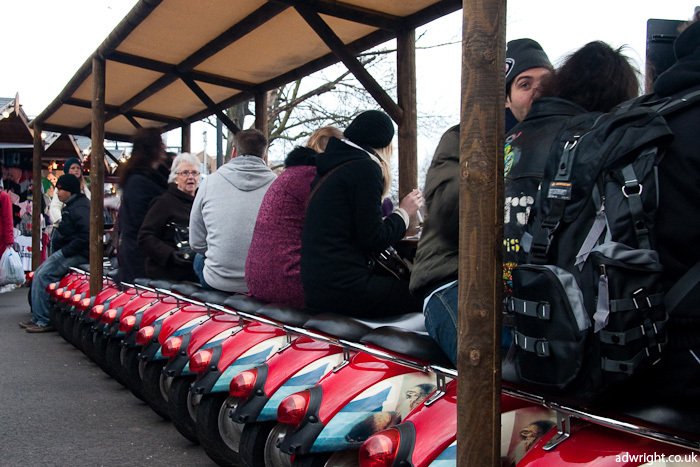 As I entered Regent’s Park, I saw the first moving vessel of my walk. As it turned out, I only saw three moving boats along the total of the ten kilometres or so that I covered that afternoon! 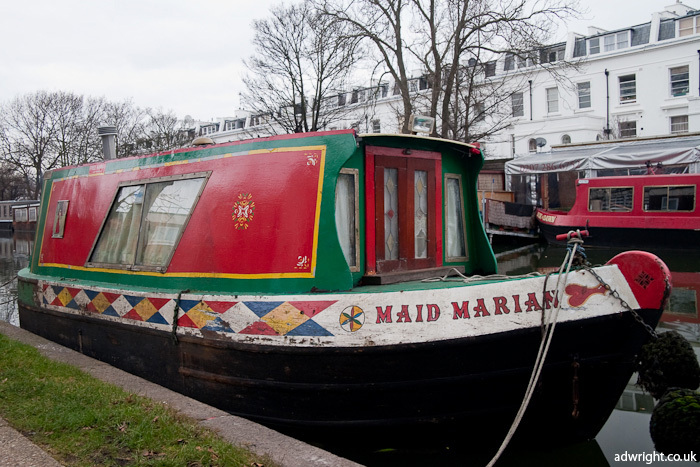 Just after I took the above photo, the owner of the boat – Emmanuel David – slowed and asked if I could send him a copy. Here you go Emmanuel! 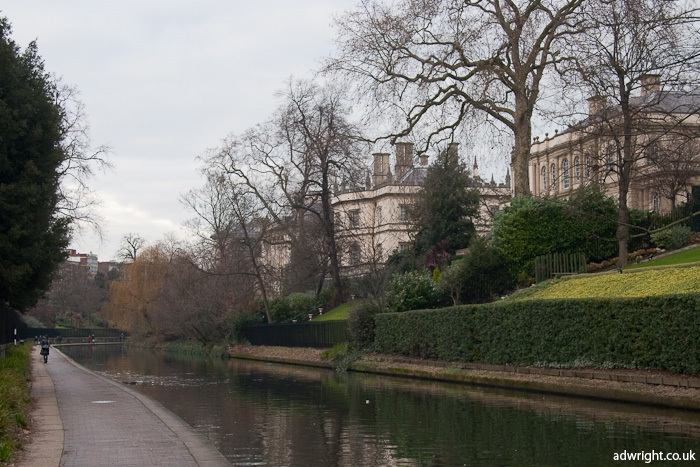 John Nash originally intended the canal to cut straight through Regent’s Park. However, it was decided to divert around the north of the park so that, in Nash’s words, “The privacy of the park will not be invaded by the commerce of the canal.” In other words, keep the riff-raff barge workers out of sight of the gentry in the park. Perhaps views have changed somewhat though, as these houses built around the Outer Circle of Regent’s Park towards the end of the 20th century each have a view over the canal and they must be some of the most expensive property in London, if not the world. It looks fairly innocuous, but the bridge in the distance of the photo below also acts as an aqueduct for an underground watercourse – the Tyburn River. 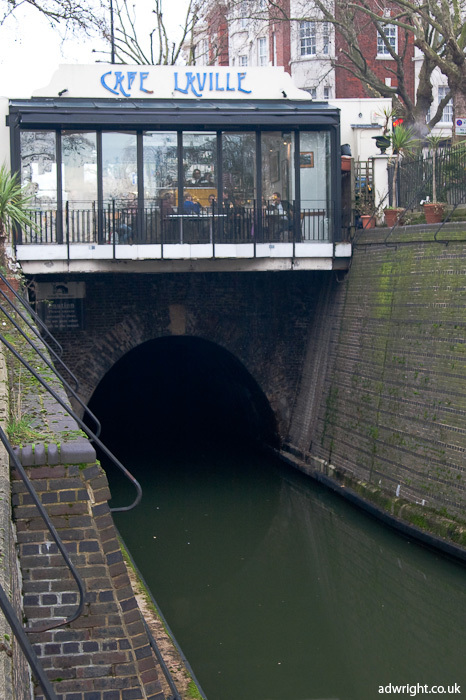 This completely subterranean river flows under London from Hampstead, through an antiques shop, over this bridge, under Regent’s Park and south towards the Thames. For more on underground rivers in London, which I have only just heard about and find quite fascinating, I suggest you have a look at some of the posts on this interesting blog. Macclesfield Bridge, also known as ‘Blow-up Bridge’; the original bridge here was destroyed in 1874 after a barge carrying munitions exploded. The zoo was designed by Decimus Burton and opened in 1828. 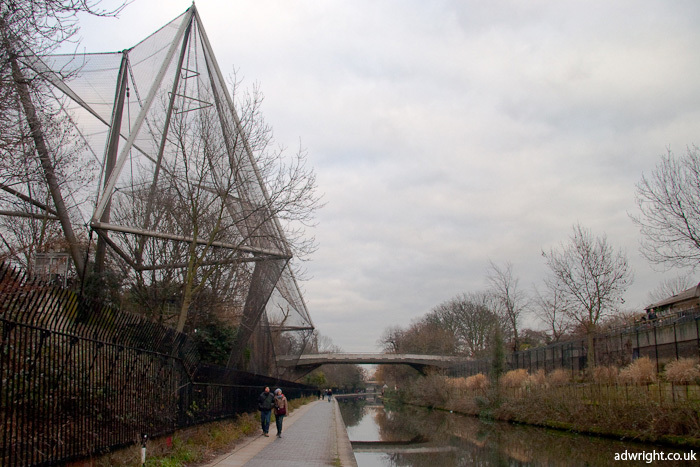 The majority lies south of the canal, but, as can be seen in the photo below, the huge Snowdon aviary, constructed in 1964, is situated on the north bank and connected to the zoo by two bridges. 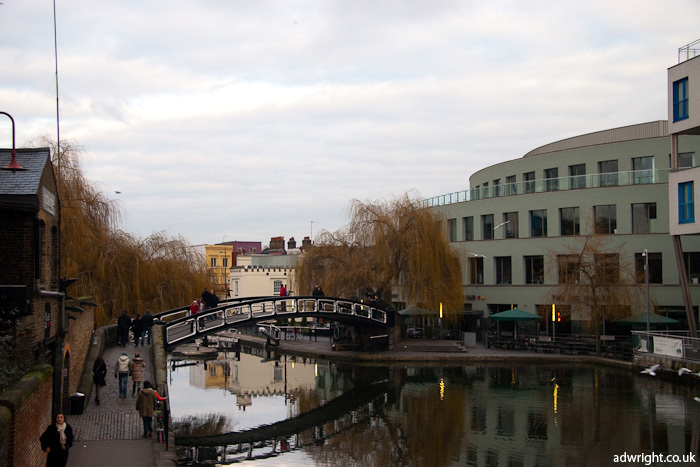 After the bridge, the canal sweeps sharply around to the left towards Camden. 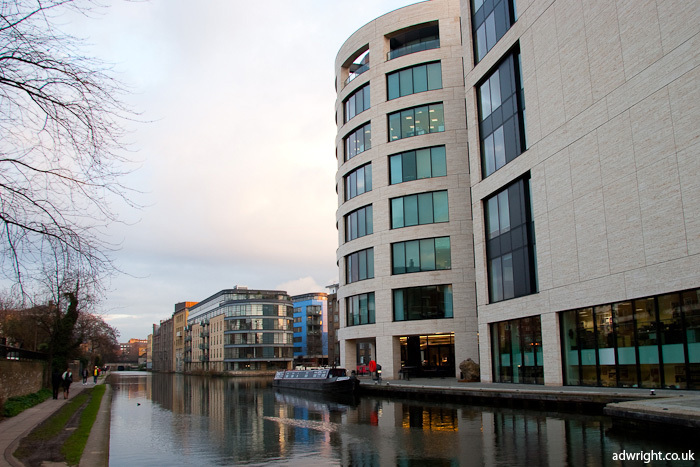 The red junk is Feng Shang Chinese restaurant, floating in what remains of a one kilometre stretch of canal that extended towards the former Cumberland Basin near Euston. Closed in 1942, the canal was subsequently filled with rubble after World War II. One of its bridges still remains today, with no water flowing underneath. 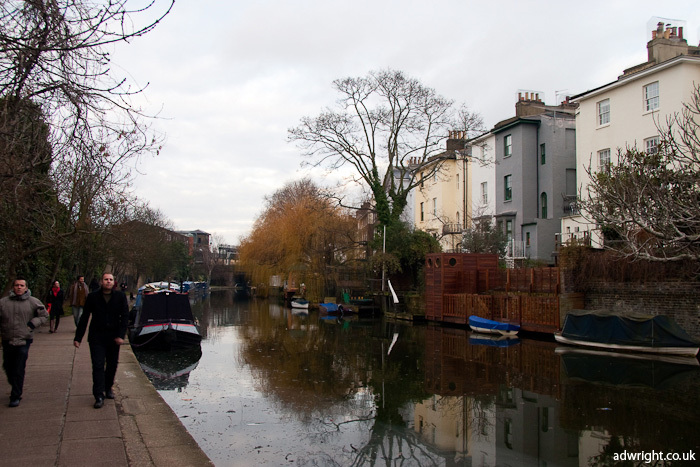 The houses along this section of the canal were built in the Regency style of the early 19th Century, which I think is one of the architectural styles that typifies London. Even though it’s rather busy with traffic, I think that Park Crescent, just south of Regent’s Park, is one of the nicest looking streets in the capital (although my iPhone photo does not do it justice). Looking back in the direction of Cumberland Basin at the back of the houses. 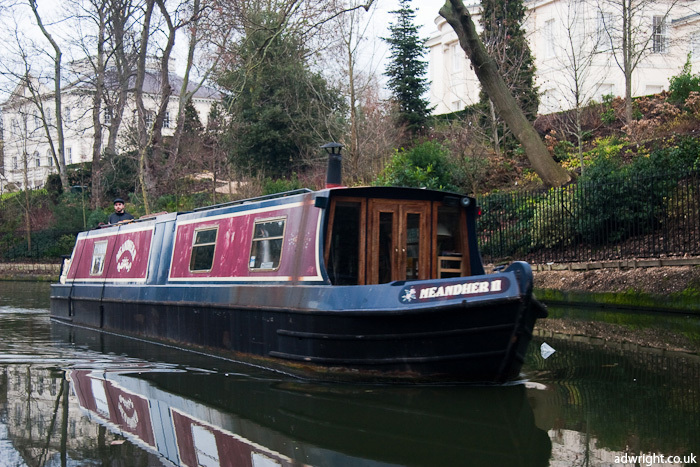 It’s nice to see that a barge is being used to transport the rubble and other waste produced in the renovation of one of these houses. 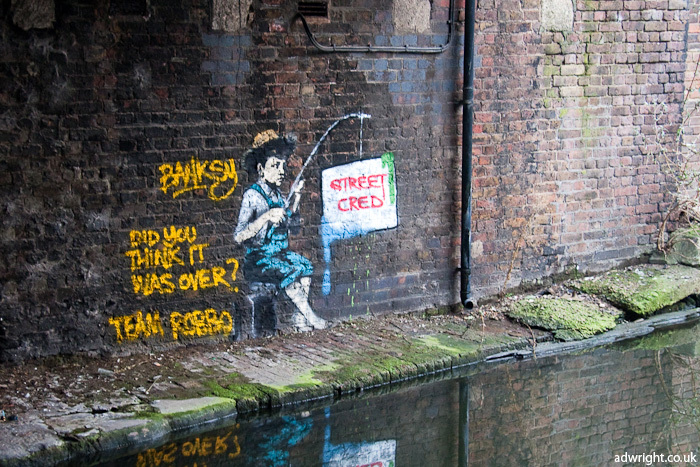 We must be getting close to Camden Town now – the graffiti is increasing. I didn’t spend too long in Camden. I’ve been here before and taken the classic shots. 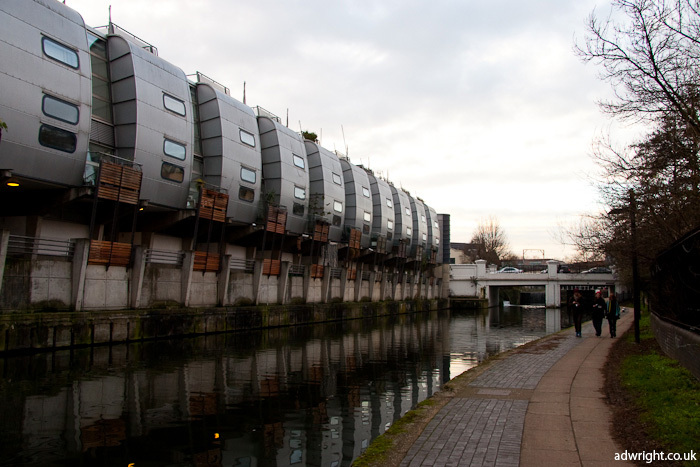 The walk from Camden to Islington has some real contrasts, with some really industrial parts, other areas which have been turned into the ubiquitous waterside residential developments, and some industrial areas earmarked to be turned into waterside residential developments. 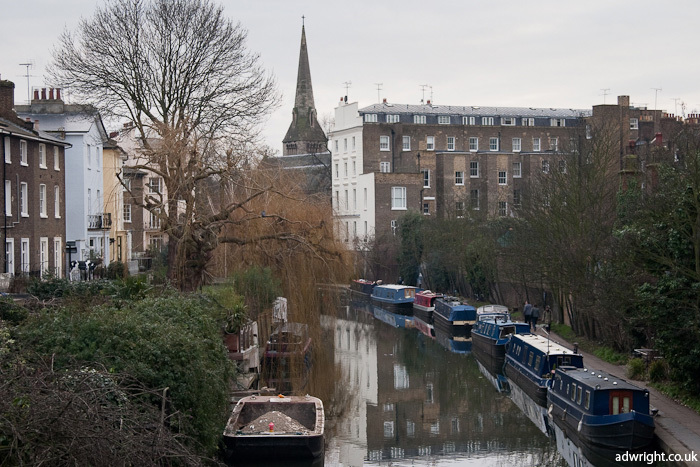 Just west of St. Pancras Lock, High Speed 1 crosses the Regent’s Canal, heading off towards Stratford, south-east England and the Continent. 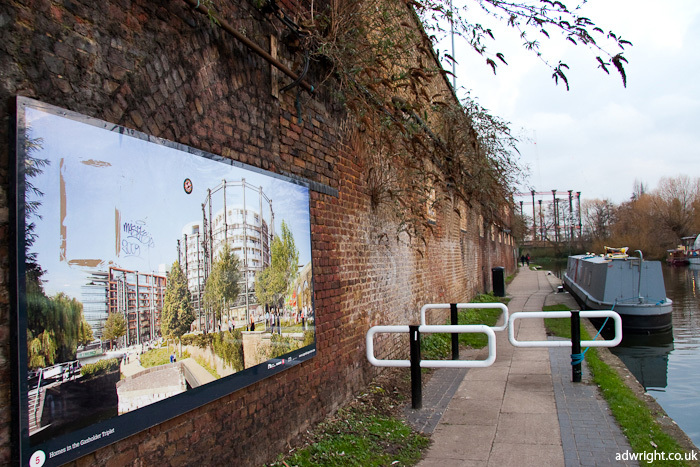 As I mentioned above in relation to redevelopment, here’s a poster indicating what may become of the gasholders in the distance. 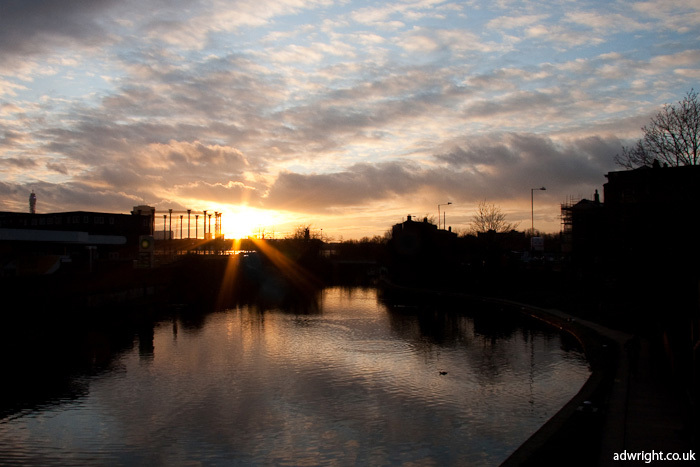 At this point in my walk, the sun finally showed its face to add some warmth to my photos, including this one which actually shows the section of Regent’s Canal under which the train lines out of King’s Cross make their way north. This is in contrast to the lines out of St. Pancras, such as High Speed 1, which cross over the canal, just a few hundred metres away. As I carried on along the towpath towards Islington, I could see the ground level starting to rise. This hill necessitated the building of the Islington Tunnel, which is the longest on the canal at 878 metres in length. 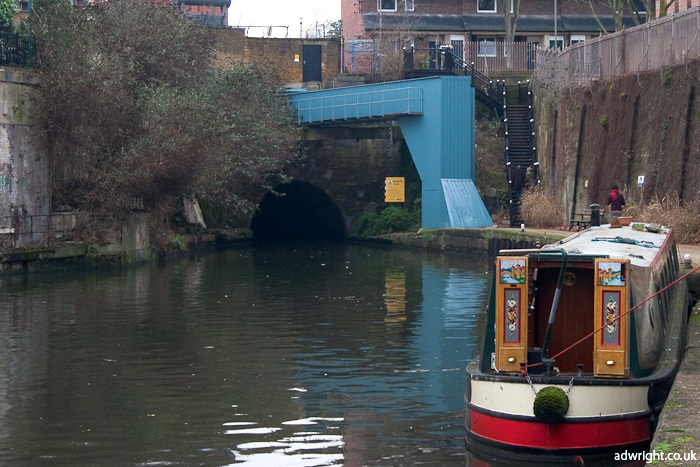 Like the Maida Hill tunnel, there is no towpath, so boats used to have to be ‘legged‘ through. 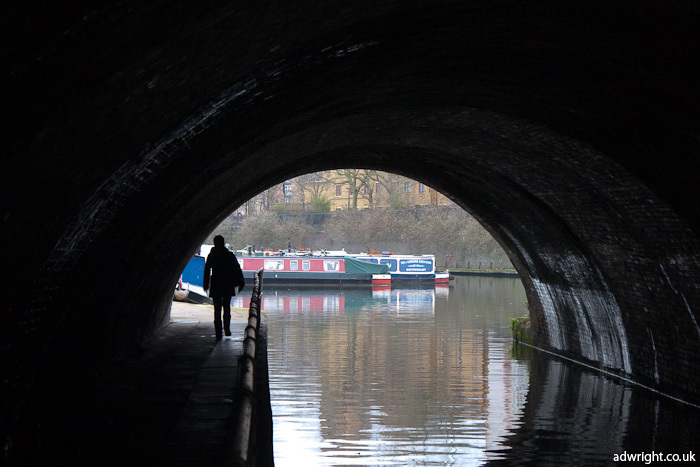 As the towpath finishes at this point, one is forced to walk through various streets in Islington to reach the other end of the tunnel. There are apparently markers leading the way, but I completely missed them and bumbled through using my own rather random route. 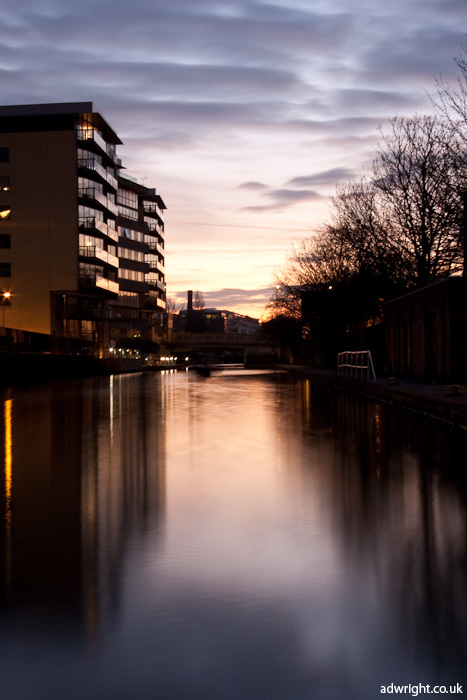 The canal emerges and carries on to the City Road lock. 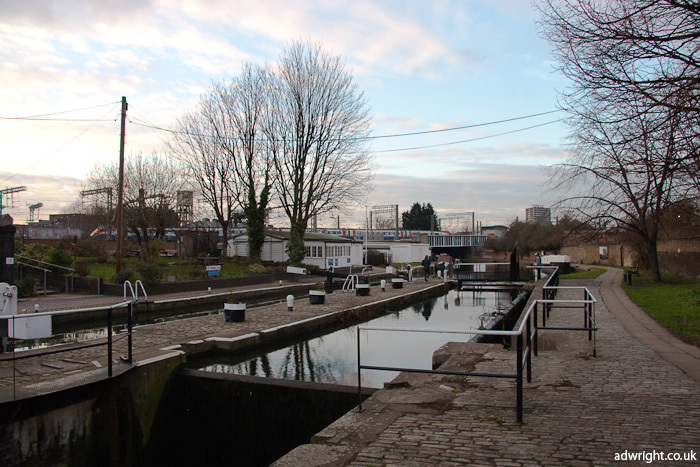 The City Road Basin around this lock is another prime residential development site. The daylight was fading fast now, so the tripod which I’d been lugging around all afternoon finally saw some use. Unfortunately, this part of the canal wasn’t particularly picturesque! I had to stop my walk here – the light had finally given up and, to be honest, the tow path from here onwards did look a bit industrial and bleak. 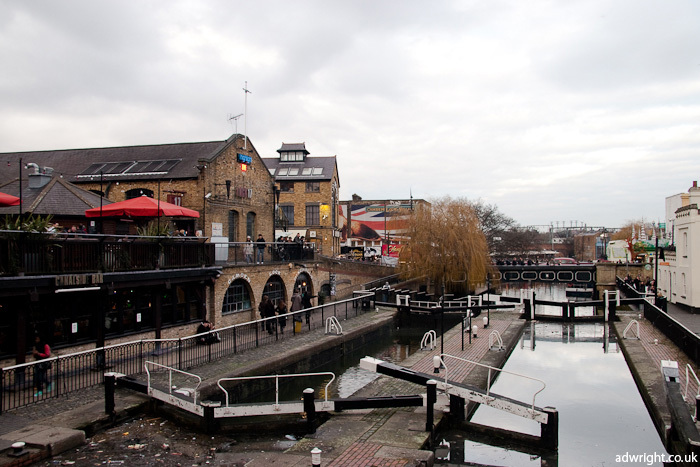 I may go back in the future and walk the remainder, perahaps starting at the end of the canal at Limehouse Basin.